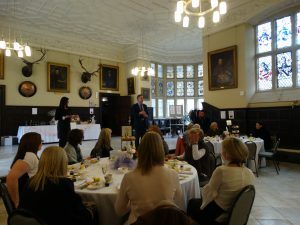 An Easter Afternoon Tea was held in the Top Ref on Tuesday for parents and friends who were warmly welcomed by St. Mary’s Hall Headmaster Ian Murphy. 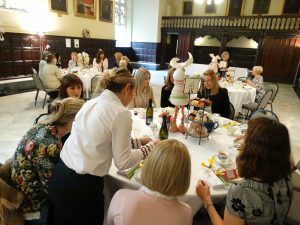 Whilst guests chatted delicious sandwiches and cakes were served by current parent Nicki Cuddy, owner of Polly’s Pop Up Tea Room, and our wonderful Greg Mann entertained everyone on the piano during the whole afternoon. 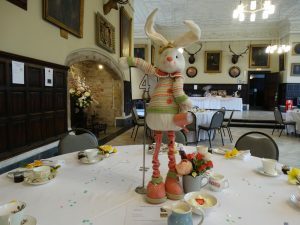 There was a raffle of Easter hampers including wine, chocolates and a Betty’s hamper and ‘Guess the name of the Bunny’ was won by Charlotte Proctor who guessed right with Pumpernickle! Funds raised from this event will provide 6 x 6 seat pro-benches for our sports department to take with them to away fixtures. The Development Office would like to thank everyone who attended for their generosity and support.